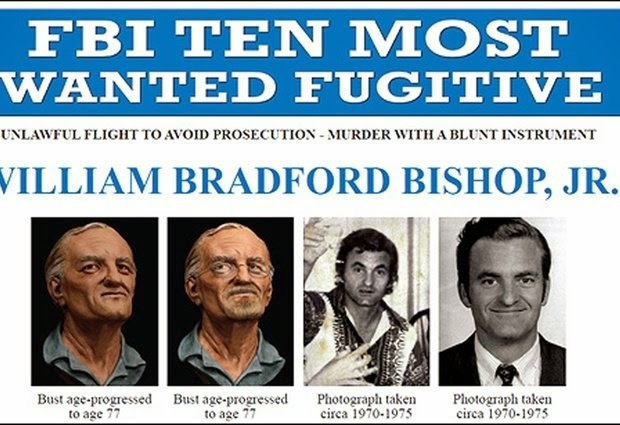 Photo: APThe FBI's ten most wanted fugitive poster for William Bradford Bishop Jr. Bishop, diplomat suspected of killing his wife, mother and three sons in 1976. WASHINGTON (ASSOCIATED PRESS) — Nearly 40 years ago, authorities said former diplomat William Bradford "Brad" Bishop Jr. bludgeoned his family to death with a sledgehammer and disappeared into the North Carolina woods. For decades, investigators believed he might have used his education, international experience and knowledge of foreign languages to flee to Europe and assume a new identity. On Thursday, the FBI had a new theory: Bishop never left the rural South, living as a homeless vagrant until he was killed by a hit-and-run driver in Alabama in 1981. The John Doe in that case bares a strong resemblance to Bishop, so authorities have dug up the unidentified remains to see if they match his DNA, the FBI said. The agency said the results could be known "soon" but wouldn't elaborate. Bishop was accused of killing his wife, mother and three sons in their Bethesda, Maryland, home in 1976. It's not clear why he killed his family, but back then, he had been passed over for a promotion and was prone to violent outbursts, the FBI said. Bishop was added to the FBI's Ten Most Wanted List in April, and in July, his case was featured on the CNN program "The Hunt with John Walsh." A viewer called the FBI to point out similarities between Bishop's picture and the photo of the unidentified Alabama man, which police in Scottsboro had publicized last year in an attempt to crack the cold case. The Alabama victim had no identification and no personal belongings beyond a slip of paper with the phone number of a truck driver who had given him a ride. He was wearing several layers of dirty, heavy clothing, according to the funeral director who helped prepare his body. "Both John Doe and Bishop have cleft chins, distinctive noses, thin lips and similar hairlines and sideburns," FBI agent Pamela Hanson wrote in an affidavit requesting that the body be exhumed. Bishop was 39 years old when his family was slain. A licensed pilot who spoke five languages, he had worked as a State Department diplomat in Europe and Africa before settling in the Washington suburbs. He had been treated for depression, and was intense and self-absorbed, the FBI said. After the killings, Bishop loaded the bodies into his station wagon, drove to rural eastern North Carolina and placed them in a shallow grave. He poured gasoline on them and lit them on fire, authorities said. His last confirmed sighting was at a sporting goods store in Jacksonville, North Carolina, the next day. Investigators said they were not sure why he took the bodies to North Carolina. Two weeks later, the vehicle was found in the Great Smoky Mountains National Park, just over 200 miles northeast of Scottsboro. Given the size of the park, which encompasses more than 500,000 acres, Bishop, an avid outdoorsman, "could have remained in the North Carolina/Alabama/Tennessee area for many years without being discovered," Hanson wrote. That would come as a surprise to three acquaintances of Bishop who told authorities that they had seen him in Europe after he disappeared. Those sightings, most recently in 1994, were never verified. The FBI has Bishop's DNA on file and will test the exhumed remains for a possible match, said Amy Thoreson, a spokeswoman for the bureau's Baltimore field office, which is handling the investigation. The retired Scottsboro police chief, Keith Smith, told The Associated Press in a telephone interview on Thursday that they held off on burying the man out of hope that his relatives would be found. "We didn't have any inkling he might be a serial killer or anything," Smith said. "Most people aren't."